Shortly after we announced Grace's diagnosis at church and at Grace's preschool, members of the church's preschool board asked us if they could do a fundraiser for Grace. 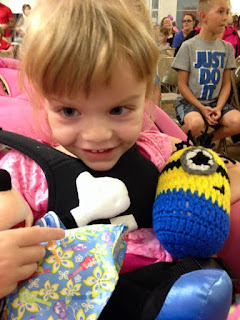 One of her teachers said Grace really liked the puppets at school and thought a puppet show, called "Giggles for Grace," could be a lot of fun and raise money for anything that we needed. Grace was very excited for the puppet show tonight, and she got a brand new Minion friend! At the time, we thanked the board for their offer, but said we weren't really going to do any fundraisers. Our insurance covered all of Grace's needs, and we just weren't sure about fundraisers yet. Then, we found out about the INAD research study, and have been so humbly overwhelmed by the generosity of our community and beyond. We told the preschool board at church they could do a fundraiser if they wanted, and we ended up deciding that fall might be better. The preschool checked with Mr. Rick Cina, who works for the Hillsboro school district, but also puts on a really great puppet show, and the kids all love him. It was originally scheduled for Aug. 21, but when Grace was granted her Make-A-Wish, Mr. Cina graciously moved it back one week. The kids just LOVED Mr. Cina's Crazy Character Comedy Show. And tonight was the night. Since Kyle was covering high school football, Grace and I went with mom to the Hillsboro Moose Lodge. We got there about 20 minutes before the show started, and were so excited to be part of such a special night. Volunteers had to set up more chairs twice to accommodate the crowd, which hit nearly 300. The church also provided free popcorn and Capri Sun drinks to everyone that came. Admission to the show was free too, and it was just a really special night. They even made several photo collages of our family, and I enjoyed looking at them. Before the show started, I got Grace some popcorn and we made our way to the front of the room. As we headed that way, a little girl named Angel Grace, and her mom, stopped to say hi. Angel had asked her mom to make Grace a stuffed Minion to play with, and they brought it for her tonight. It's just the perfect size for Grace to hold, and she even snuggled it when she went to bed tonight. Grace was very excited to see her preschool teachers at the show tonight. Then we got ready for the show, "Mr. Cina's Crazy Characters Comedy Show" to begin. The first character we met was Neal the Seal, who liked to do tricks, including a pie in the face for Mr. Cina. Then we met Gary the Gorilla, who wanted to be a disco dancer. Around 100 kids were sitting on the floor near the stage, and they just laughed and laughed throughout the show. It was so much fun to see them enjoying themselves, and Grace really liked it when everyone laughed. The next two characters were Hilda the Hippo, who really liked compliments and Phlegm the Monster, who had hygiene issues. I think the kids laughed right up until the last minute, and we just loved being a part of it. And Grace loved all the people who stopped by to say hi after the show. She even got a smiley face balloon, which might have been one of her favorite parts. The puppets were definitely the hit of the show! As the show came to a close, the preschool board gave us more than $700 raised in donations and shirt sales. We continue to keep the money together to take to Washington University this fall, and know that our community will make a difference in the fight against INAD. Thank you SO much to everyone who made tonight such a success! Thanks so much to everyone who came out to the puppet show tonight and those who helped to organize, set up, clean up and volunteer. Our Grace definitely felt special tonight.